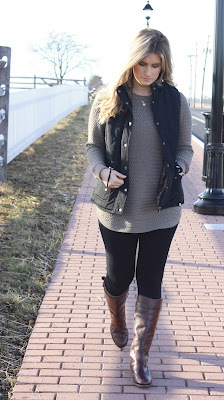 This post is all about putting basic pieces together to create a comfy and casual look. As you can see by looking over my previous post, I am all about the vest. If you see me out I am most likely wearing a vest over a jacket. With that being said this piece is one I was excited to share with you! I was thrilled to find a fur lined vest. It is surprisingly warm! I have to talk about my L.L.Bean Boots. I am such a huge fan of L.L.Bean especially for my fiancé, Cody. I recently received these as a Christmas gift from him and I must say, they are my favorite pair of boots. The quality is outstanding! I can't find the exact ones that I have, but I linked a similar pair. Yes they are splurgy, but I know they are well worth every penny! Plus they come in extended Calf, which I need. I am thrilled to be back on the blog. I have missed posting! My New Year's Goal is to post more consecutively here on the blog. I Love You Bunches!